2014: as Picasso had his blue period, Kristin Calabrese is having her black. History marches away from her paintings. Steadily remain the physicality of brushes and colors, the tension of the canvas, and an artist who has devoted her life force to painting. Since the frame contains her “magic carpet” – as she calls the white surface – which is also her freedom, Calabrese gives form to reflections of any thing the eyes can reach. An urban landscape, a broom, a shadow on the wall, holes in the ground: things as they exist. Painted, they exist in a space of feelings so strong they seem inevitable. Which is of course not true. Over time, images change in anyone’s mind. 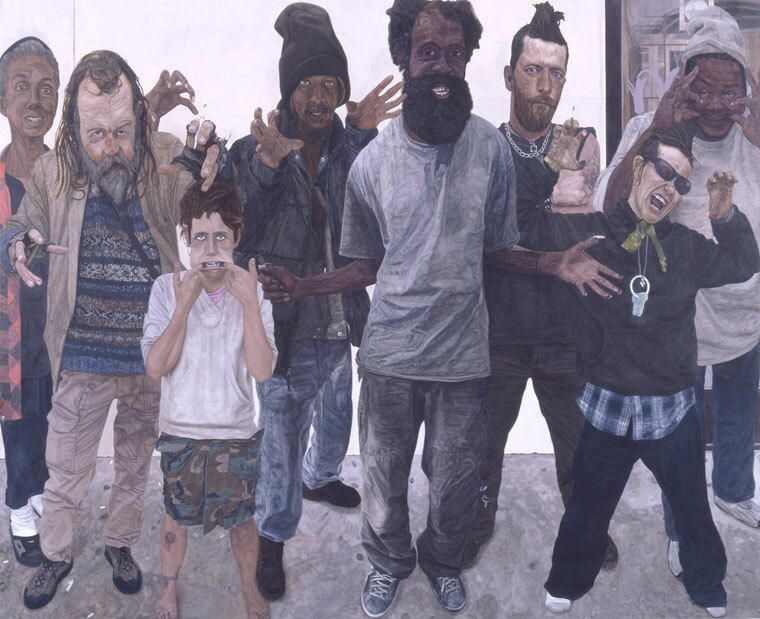 Not long ago Calabrese wanted her paintings flat, with no transparencies. 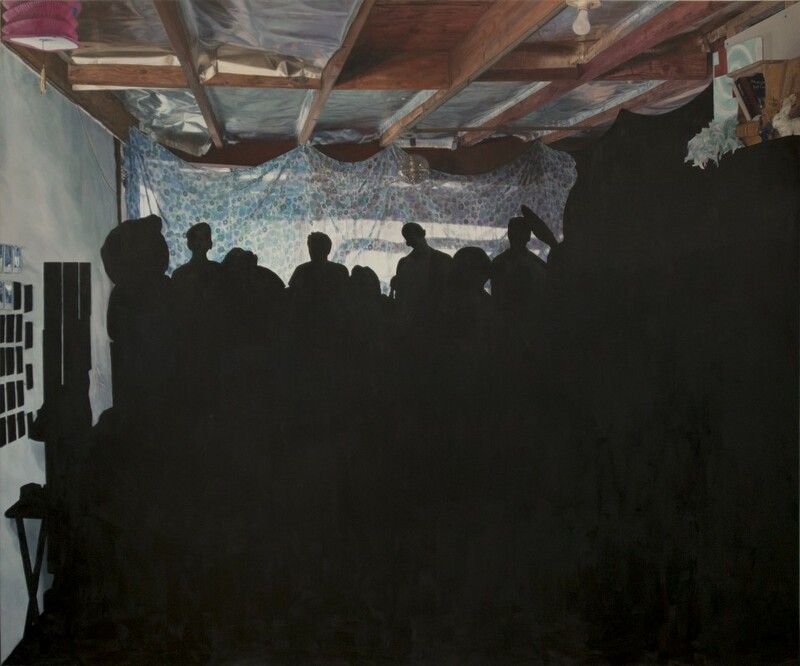 Today she presents Lights Off, 2014, a painting that shows layers of motion in her mind selected by life over several years: at the top, a ceiling painstakingly executed mirrors the real ceiling of her private room (this artist only paints from life); the bottom is pitch black like a cat fur and ends with silhouettes of viewers looking at … something. In real life the something was a piece of fabric horizontally hung between the sides: it has become a transparent veil holding small flowers floating in the air, and it’s a perfect illusion of reality, it is only there to mitigate an explosion of light from the void. Viewers? They must be blind. Blackness of not seeing, maybe not able to see the secret stories that art and poetry introduce in our lives. “Black is death,” Kristin Calabrese says with no hesitation. It grows illusionism in her art, while illusions are absent. Remember? We shall not get to the bottom: / death is a hole / in which we are all buried / Gentile and Jew. The flower dies down and rots away. / But there is a hole in the bottom of the bag. It is the imagination which cannot be fathomed. / It is through this hole we escape . . So through art alone, male and female, a field of flowers, a tapestry, springs flowers unequaled in loveliness. Through this hole at the bottom of the cavern / of death, the imagination escapes intact. Calabrese paints flowers and calls them Seen and Unseen, 2013. Or she paints black the flowers themselves, and in the painting they become Depth of Field, 2013 on a rainbow background. So the Red Ink Drawings, 2014, declaring their independence from the pencil-drawn grid they coexist with on the same canvas, are not abstract at all. They are stories at rest, each unique, so still they don’t breath.